Did you know there are only 127 days until Christmas? While I’m not quite ready to think about Christmas yet, I do want to share this collection of holiday stories. 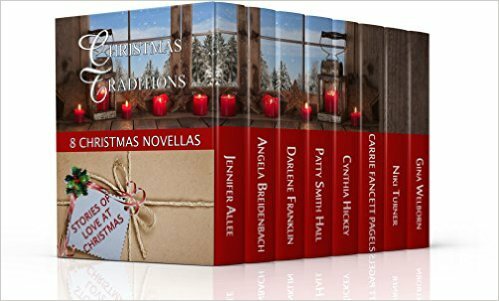 Whether you’re treating yourself or stuffing cyber stockings, the Christmas Traditions collection is a great gift at a great price! Eight heartwarming novellas of Christmas’s gone by where the true meaning of the season warms your heart and love flows as fast as apple cider. Grab your favorite drink, no matter the temperature outside, curl up in a cozy chair and lose yourself in holiday romance. Each of these gifted authors brings their heartwarming story to life with endearing characters and an engaging story line! At the time I read these stories individually, Angela Breidenbach’s novella was not available. However, I have since purchased the collection and plan to enjoy Eleven Pipers Piping soon. Nutcracker Christmas– Jennifer AlLee has written a beautiful story that will warm your heart and bring a smile to your face. Isabella Brandt is a lovely character and I loved reading her story! An Apple for Christmas– An Apple for Christmas is a wonderful novella! Darlene Franklin has penned a story as sweet and delicious as the apples she has written about. Christmas Lessons– Patty Smith Hall tugged at my heartstrings in this Christmas novella. I loved Claire Davenport and Billy Warner and their rekindled romance. Handcarved Christmas– Handcarved Christmas is a beautiful tale, brimming with love! Cynthia Hickey deftly expresses the emotions of her characters when an unexpected gift becomes a great blessing. The Fruitcake Challenge– I opened the pages of this novella and stepped into a lively lumber camp of 1890! Carrie Fancett Pagels brings to life a delightful cast of characters, as well as the sights and sounds of Northern Michigan. Sadie’s Gift– Niki Turner shares her gift of writing in this inspiring novella. From heart-wrenching to heartwarming, Sadie’s Gift is a wonderful Christmas story you don’t want to miss! Holly Daze– Holly Daze is a wonderful story! I love Gina Welborn’s writing and was delighted by her charming, holiday novella!